In the chilly Spring, following the late snowfall, a Continental holiday sounded like a good alternative to the usual wet British summer. On impulse, I decided on a visit to Regensburg. Our fellow tourists in China had been a group of Bavarians, and they’d recommended this city. I have to say, I’d endorse that. For the atmosphere of Old Europe – the cobbles, the tiny alleyways leading to the river, the baroque architecture – it’d be hard to beat, though I admit my experience is limited. Night life looks cheerful and varied too; mainly around the theme of beer! I booked a hostel for a few days in July, and considered the journey. It didn’t seem enough of a challenge to fly; I wanted to see some of Europe from ground level. 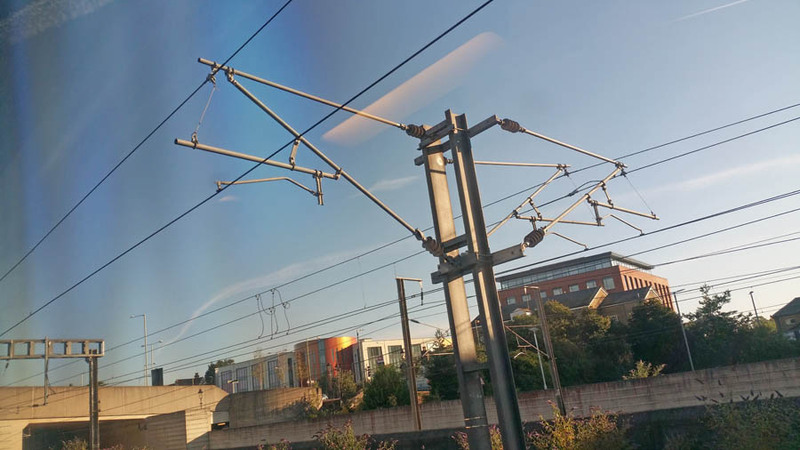 I’d never been on the Eurostar – I decided to get the train. Booking the trip was difficult. Our upload speed here is so poor that security checks time out before completion, so I have to pay for orders by phone. None of the budget train companies have an effective phone line for this; you’re routed around in a circle back to their website. 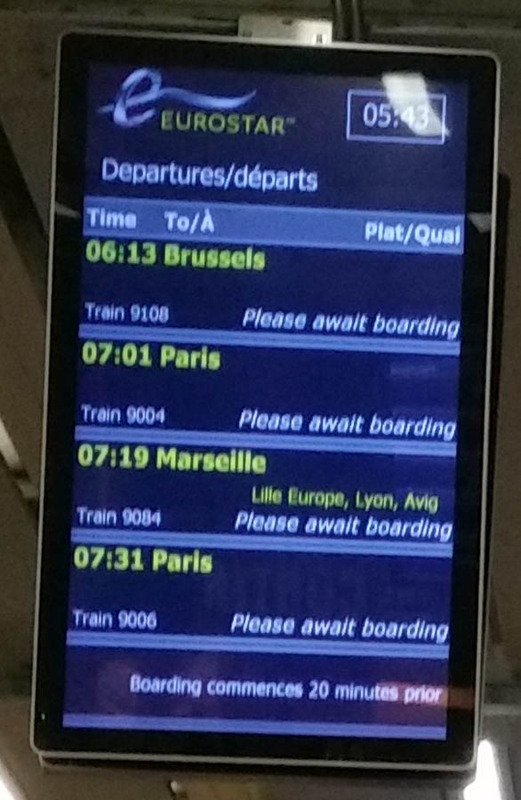 Eurostar did eventually answer their phone after a long wait and confirmed that they did take payment on that line. However, I had to check the rest of the travel first, so I called Deutschbahn. I expected yet another recorded information line, but was pleasantly surprised when the phone was answered after two rings by a helpful lady who spoke perfect English. I bought a ticket, including the Eurostar, for about £200 return. There were a couple of seat reservations – which turned out to be important – and exchange fees in there too. The tickets arrived within the week, carrying a stern admonition not to lose them. It’s always useful, or at least comforting, to carry photocopies of important travel documents like these. Your travel insurance may be able to help if there’s a problem. 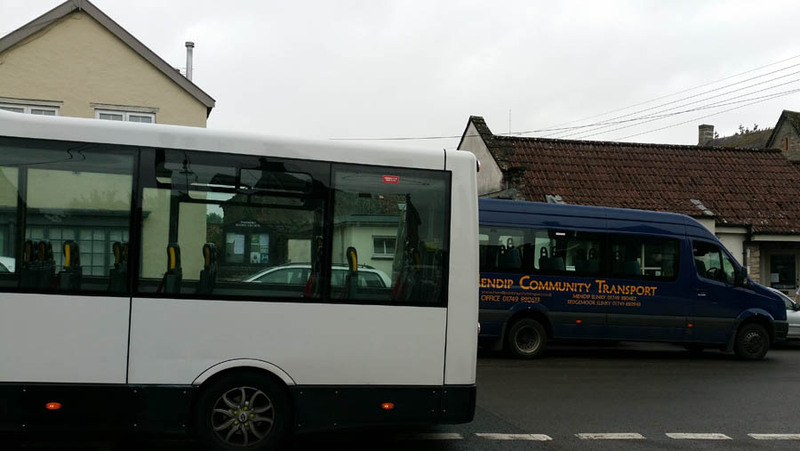 Somerset is a bit disconnected with public transport, as well as the internet. The most chancy part of any journey is the bus from the end of my road to Bristol, where international travel begins, so I never cut it fine with timing. Booking on the 6.13am Eurostar had saved me nearly enough money for a cheap hotel in St Pancras, allowing the trip to London to be made in a leisurely fashion. This time, however, it wasn’t the 376 bus which let me down, but Great Western railway. I was warned the previous day, by email, that trains would be disrupted and it would be good if I went another day. I had to go to Bristol tiresomely early, and got on a very crowded train to London Paddington. 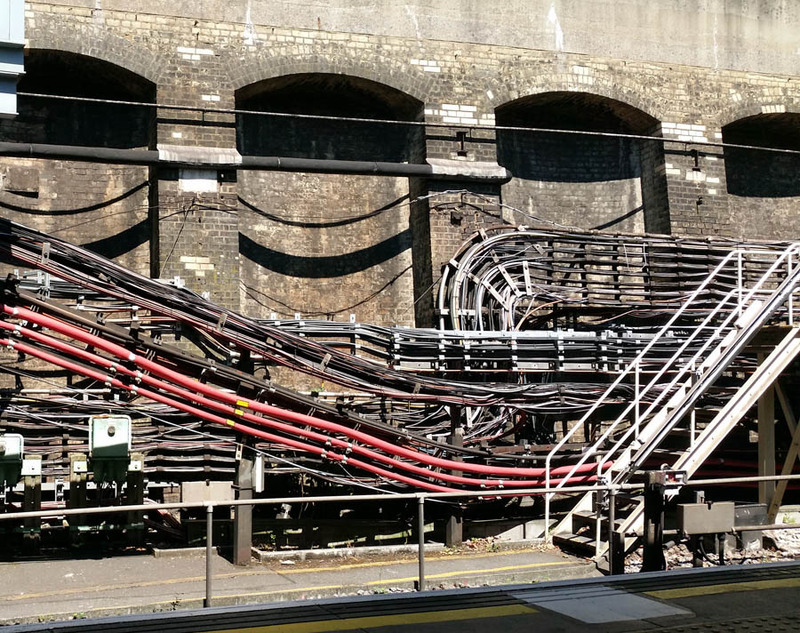 However, as part of the research for my adventure, I’d read ‘Infrastructure‘ by Brian Hayes, and was soon diverted by observing the complicated arrangements of wires, poles and boxes whose functions I was learning. 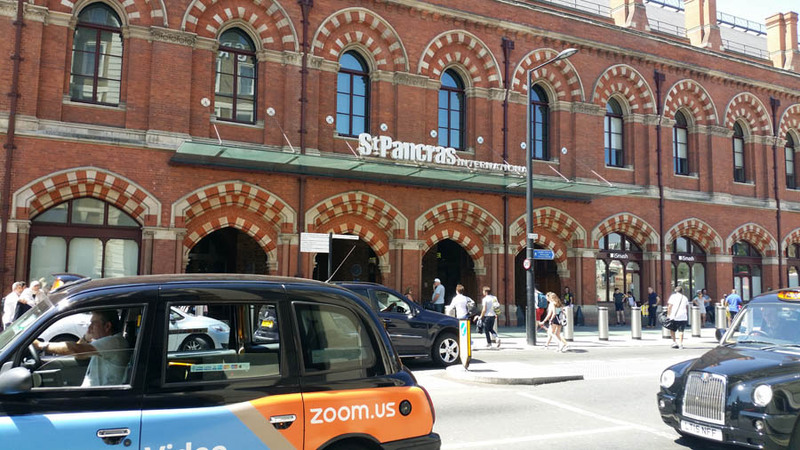 Navigating the oppressively hot Tube to St Pancras, I arrived an hour early for check in at the European Hotel in Argyle Square, a couple of minutes walk from the station when you went the right way. I had lunch under the shade of the trees in the little dusty park opposite while I waited. Once I’d left my luggage in the tiny room, I walked to the British Museum, not far away. There was an interesting exhibition of ethnic art, mainly from sea-going communities, but the place was packed and the air conditioning inadequate. The streets were depressingly litter-strewn as well, and the bins not emptied often enough. For a major tourist destination, London could do with some work! It was much cooler the next morning at 5 o’clock when I headed for St Pancras International. The check in for the Eurostar resembles that for air travel; you’re advised to start the process an hour before departure. Although manual check-in was quiet at this time of day, it had been quite crowded the previous afternoon. 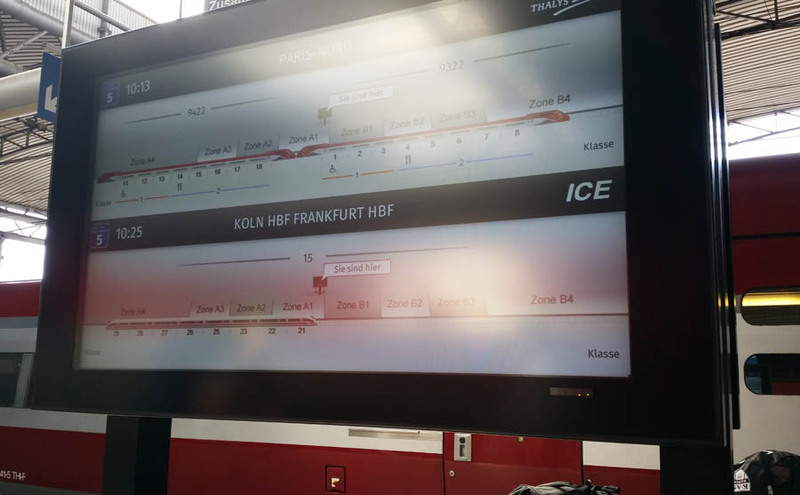 With Deutschbahn, the ticket is a Fahrkarte. The other official bits of paper are only the Reservierung, reservation slips – make sure you have the right one ready! The Departure lounge had only one cafe-bar, and probably not enough seating for busy periods. Boarding begins about 20 minutes before the train leaves, when there is a terrific rush for the right platform – pointless as all seats are reserved! It was difficult to find the right coach, as their numbers were shown on a digital display which one needed to be looking directly at. From the side, it seemed to be a plain metal insert of some kind. The train was quiet at this early hour, speeding through the waking countryside. A brief glimpse of the sea, then we plunged into a dark and featureless tunnel. Emerging into daylight, it was difficult to believe that this was France. The pylons were a different shape, and the sea was behind us. 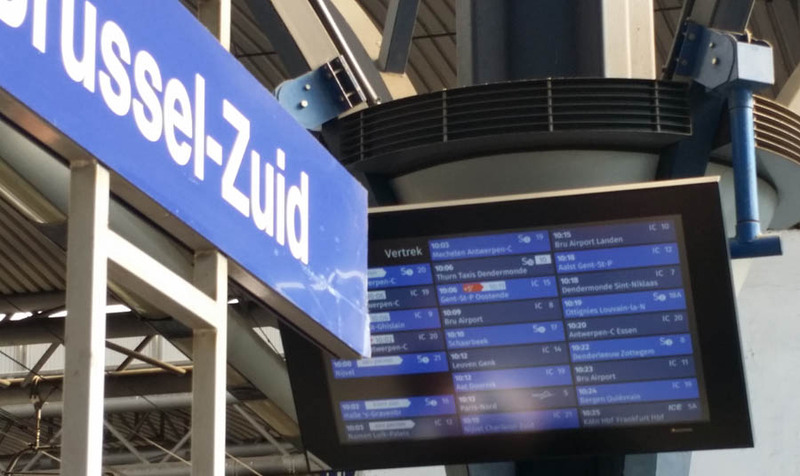 I’d been a bit worried when planning my journey that trains to Germany left from Brussel-Zuid, while the Eurostar arrives at Brussel-Midi. They’re right next to each other. 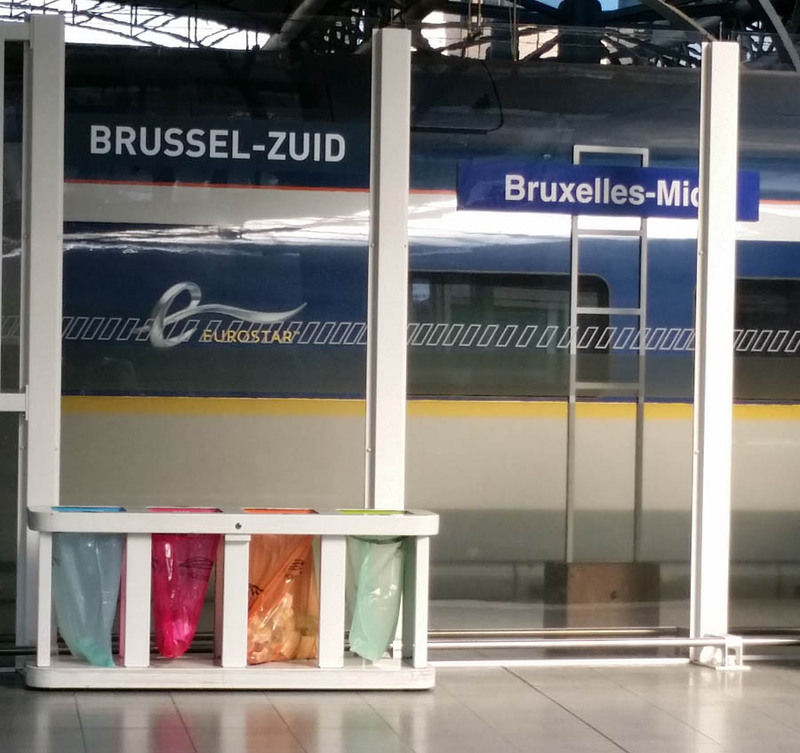 Exit the Eurostar platform towards ‘Correspondances’ and that takes you to the Brussel-Zuid end of the station. Find your train on the departure board. It’s useful to know the train number, which should be on your ticket. I headed for Platform 5, but this soon became so crowded with passengers and trains for Paris Nord, that the Frankfurt train was relocated to Platform 3. Luckily I’d been chatting to a Belgian lass, who tipped me off, as I wouldn’t have known from the announcements. Keep a close eye on those destination boards for last minute changes! Your train vanishing from this helpful platform display may be another clue that it’s not coming! There was more trouble in store for me at Frankfurt, where I accidentally got off at the Frankfurt Main (Airport) stop. A main station in Germany is, of course, a Hauptbanhof; ‘Main’ in this case was referring to the river, as I realised much later. However, everybody else was leaving the train, so I followed. By the time I had worked out what was going on, it was getting late. Hastily buying a ticket for a regional train which would take me to Frankfurt Haubtbahnhof and my connection to Regensburg, I raced to the platform. We all dashed over the bridge to another platform when the train arrived there instead (this seems to be a popular sport! ), then there was a painfully slow journey as it stopped very thoroughly at a number of stations on the way. I arrived three minutes before my train left, found its number on the destination board, identified the platform and ran down a very long concourse to arrive with seconds to spare! It was some time before I could catch my breath enough to look for a seat! Someone had mine; the conductor found me another one when the train got busy, and people were sitting in the corridor. I discovered the reservations were marked on more of those obscure digital displays beside each seat. I had wondered how people identified free seats. Despite the difficulties, most of the trip was relaxing, and I did get a good view of the changing countryside. Deciduous forests changed to conifers and back; there were fields of solar panels, and grape terraces. Clusters of whitewashed houses stood among pasture; sometimes we effortlessly outpaced motorway traffic to a backdrop of clean white factories. I arrived in Regensburg at 5.30 pm. 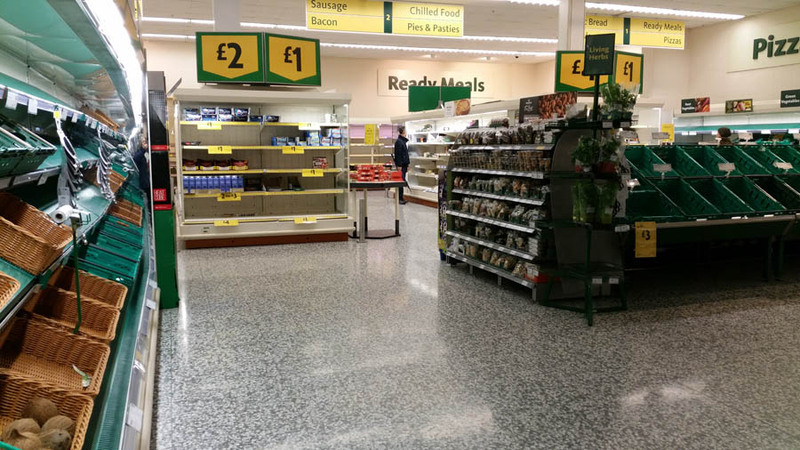 Head straight for the exit at the station – don’t get drawn into Retail Hell, from which it can be hard to extract yourself! The number 17 bus to the hostel was not every 6 minutes as Google had suggested, but more like once every hour. I managed to navigate to the Microverse using my printed-out map, and asking locals in my rudimentary German; it was only about twenty minutes walk. Once at their office in Arnulfsplatz, I picked up one of those splendid town maps which are torn from a huge pad, and appear at hostels all over Europe. Bus stops, street names and tourist attractions were all ready for a few days’ exploring! Your travel insurance may help if you miss a connection due to a delay or other problem with the trains. Try and get someone to sign something for you. If you miss it through stupidity, you could well be on your own! Luckily, buying a train ticket just before departure seems to be the same price as advance tickets in Germany. A valid credit card provides a useful contingency plan. 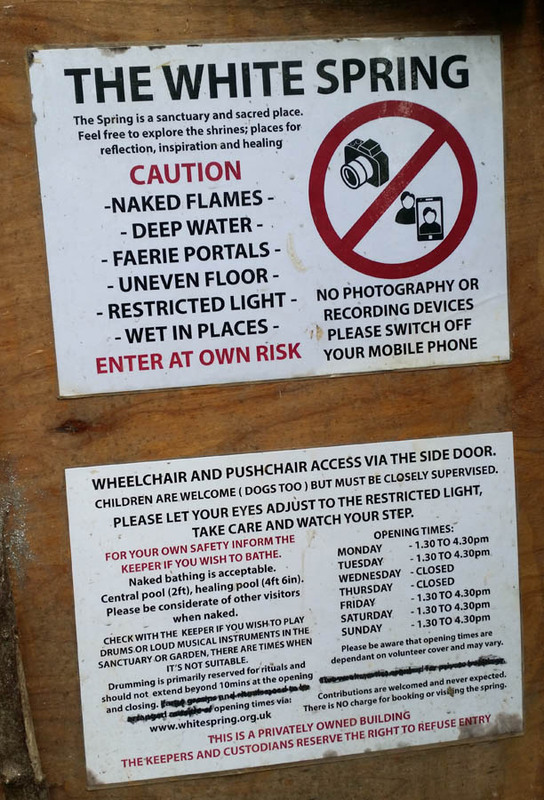 Following on from my visit to Town Tree Farm nature garden in early Spring, I decided to create a photo-journal about it, visiting every six weeks or so and recording the changes. 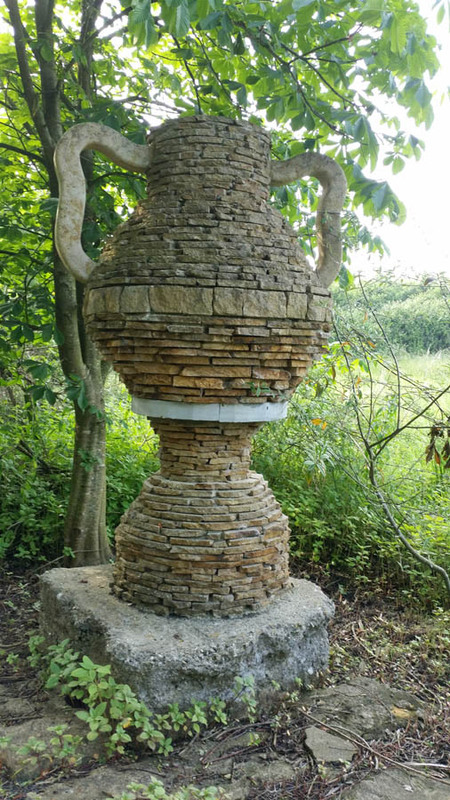 The trees around this urn sculpture are now in full leaf. 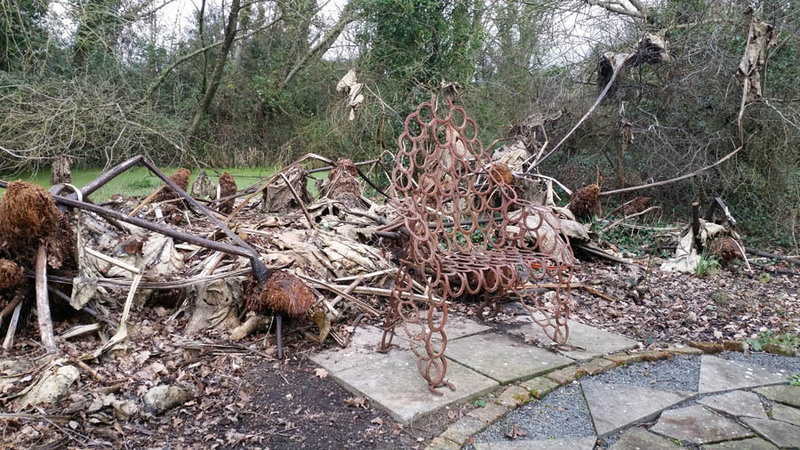 A more spectacular transformation is taking place in the wreckage of the mysterious plants – the chair is much larger than a normal one! This was the scene in February. In March, a very few tiny green shoots could be seen in these great piles of fallen stems and flowers, but by late May, a whole jungle was springing up! Below is another clump (without a chair in the way). You could use that image to try and identify it – search programmes struggle to come to terms with the scale. It probably isn’t a West Indian gherkin. The Nature Garden is a labyrinth rather than a maze. There are only a few places where you can take a wrong turn and get lost, and these are service tracks, only visible in winter. 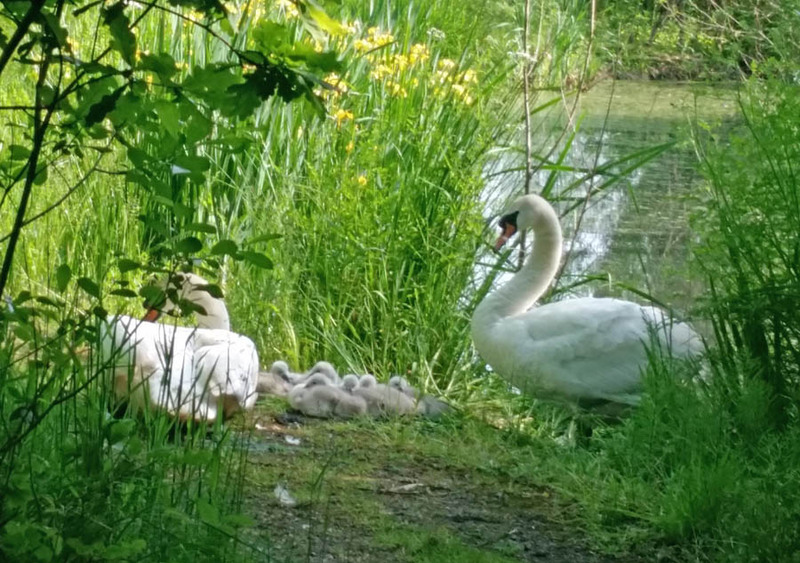 The paths are usually bordered on both sides by water – pool or wide ditch – so when you encounter a family of swans there’s no way around them! We persuaded them back into the water on the way into the gardens. The male chased us furiously up the lake once the cygnets were safe, but stopped short of following us along the path! Unluckily for us, they were back when we returned. It was now early evening and they were settled for the night. Why a creature would spend so much effort adapting to life on the water then park its young on a path which must be used by every predator in the district is a mystery to me! They recognised us; they didn’t like us. We retreated to consider our options. Swans are quite dangerous, but my companion walks with a stick and it was several miles to the road by the other route. There was a big pile of dead pine brush by the track. Arming ourselves with long branches tipped with large fans of twig, we approached the birds in what we hoped was a confident manner. They hissed and raised their wings, glaring menacingly, but as long as we kept the twigs between us, they couldn’t get to us and we managed to edge past! In future, we may avoid the Nature Garden on spring evenings! Once the cygnets can fly, the family departs on their travels. Even though the whole globe has been mapped out and uploaded, adventure can still be found in the details. The Somerset Levels are best explored by cycle or on foot, but there is one bus which crosses them. The number 67, from Wells to Burnham-on-Sea via Wedmore, takes the intrepid traveller right through this iconic countryside to enjoy a couple of hours at the seaside. A distinctly rural minibus pulls up at Wells Bus Station, down the platform from its sleek, Bristol-bound brethren, and we are off on the ancient trackway to Wedmore. The modern B3139 follows this intricate path, connecting two projections of higher land separating broad expanses of marshland. Building space was limited on this dry ridge; the hamlets are strung along this narrow, twisting country lane, almost submerged in greenery at this time of year. Exuberant hedges are covered in flowers; creamy elder, clouds of pink-blushed hawthorn, spikes of lilac and chestnut, curves of honeysuckle. Gaps in the foliage reveal little orchards, families of black sheep, contented donkeys. We pass through Yarley, Bleadney and Theale, past ivy-draped stone walls, verges scattered with the white flowers of cow parsley, fields decorated with buttercups, and into Wedmore. 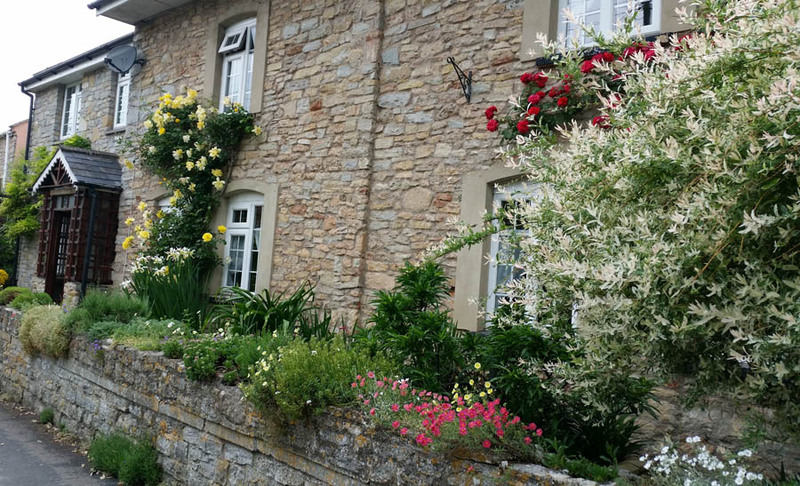 Here, there are elegant town houses, stone built cottages with purple flowers pouring over garden walls, and foxgloves in full bloom. 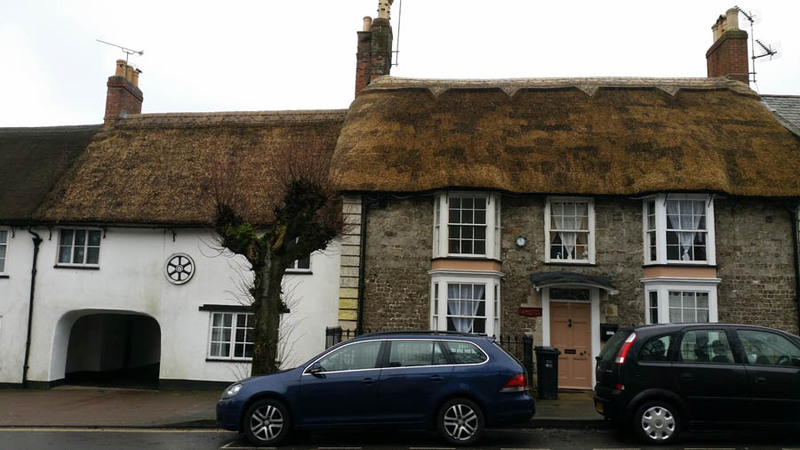 Wedmore, founded by the Saxons, was a busy market town in medieval times. The Market Cross dates back to the 14th century, and there are some other building of historic interest. 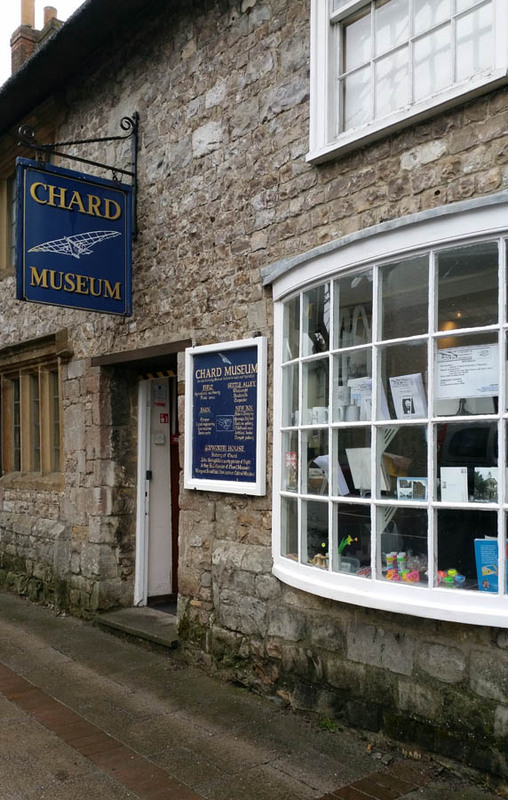 Wedmore is the home of the infamous Turnip Prize for modern art, and an annual Real Ale festival. You could plan a few hours wandering around this pleasant area and return to Wells, but we are changing here for Burnham-on-Sea. Our next driver was a trainee, learning the invisible stops on the route. The passengers cheered when she edged past a horse box on a lane where ‘single track road’ would be a generous designation. The countryside is more open as we approach the sea, crossing the old tidal marshes on our rocky ridge. Black and white dairy cows, familiar to Glastonbury Festival followers, graze in the summer pastures. Swans resting by willow-hung streams are a reminder that these fields are the domain of waterfowl in winter time. Another set of villages is linked by this slender road, like beads on a wire. We pass quaint churches, pubs, an aquafarm and an Aikido centre. The bus begins to fill up, mainly with elderly local residents. 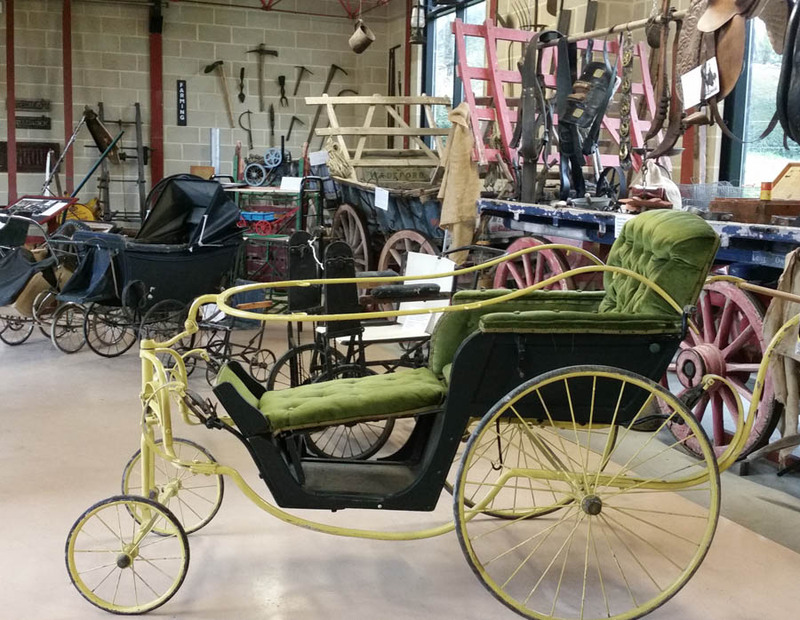 Sit at the back if you can, as many passengers have walking frames or shopping trollies. There isn’t a bell to ring; call out if you need to get off before the terminus. The other passengers join in until the driver responds! The gentle rural lane ended at the A38, the main coast road, lined with caravan parks. We detoured through Highbridge and arrived opposite the Old Pier Tavern in Burnham. 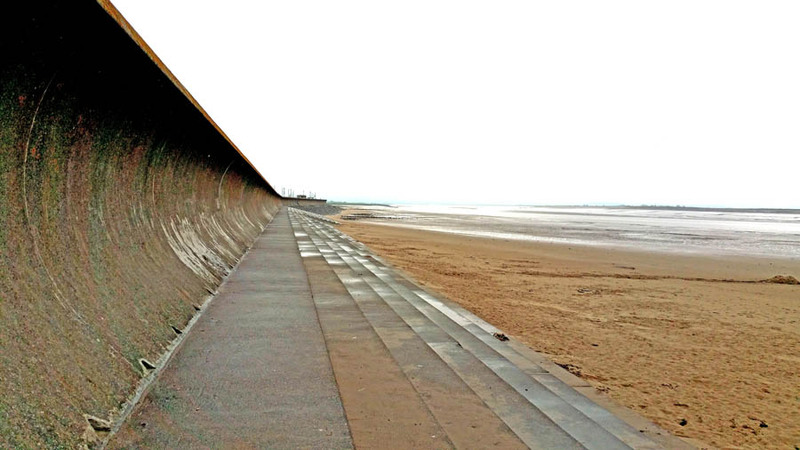 It’s a short walk – about two minutes – to the sea front. 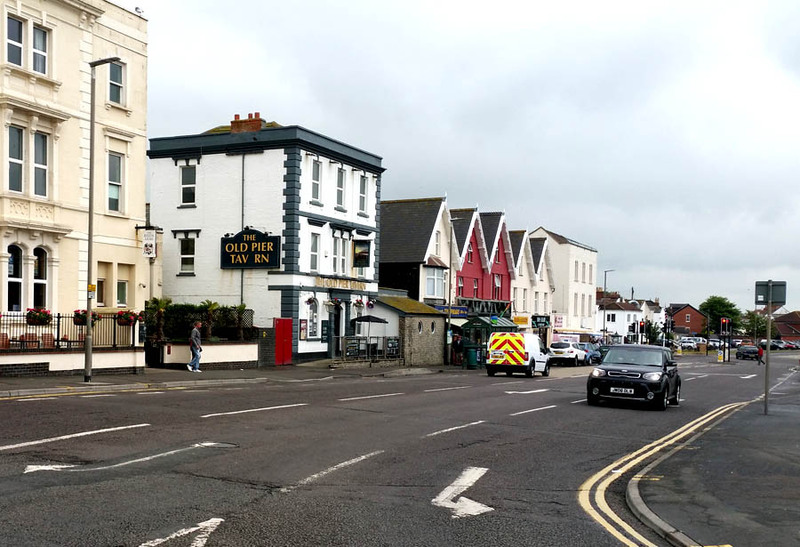 There’s a typical British seaside sort of building there, housing the Bay View Cafe, a remarkably well stocked Tourist Information centre, and public toilets. 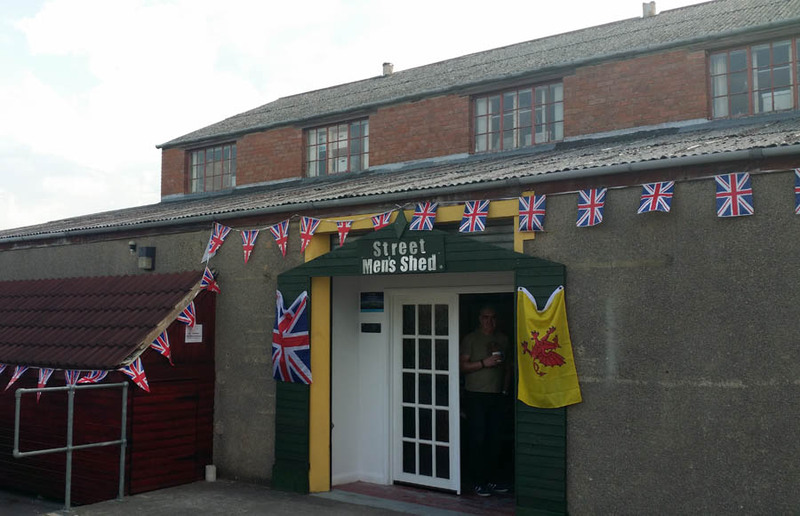 I picked up a leaflet for the Heritage Trail in Burnham, found the main street easily, past the bucket-and-spade shop. There was a Farmers’ Market going on, and the second hand shops were worth a visit; there were coffee shops and cashpoints, icecreams, seaside rock in strange and wonderful flavours, chips and amusement arcades. Everyone was excited about the Food Festival on Saturday; unfortunately the 67 bus doesn’t run at weekends. 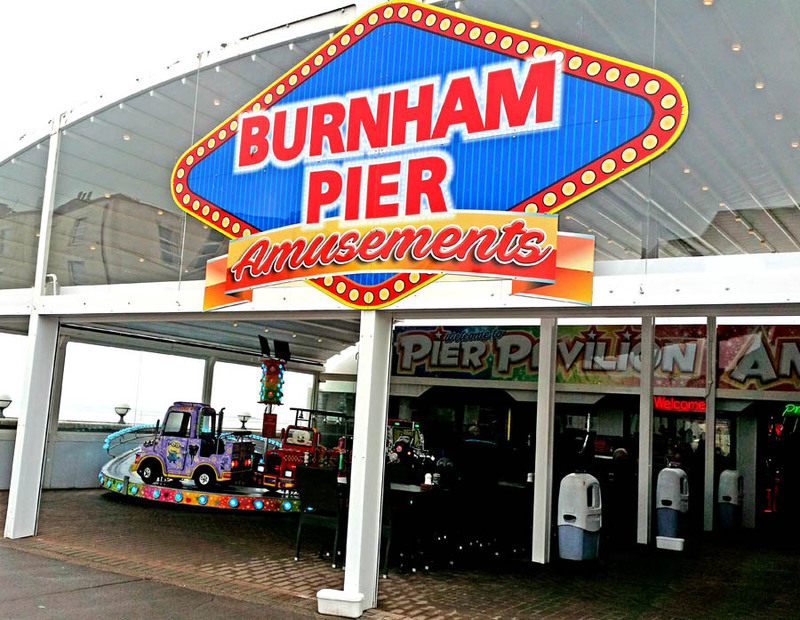 Back at the seafront, there was a good view of the Low Lighthouse, Burnham’s iconic landmark. This was built in 1832, and is still operational; the remains of the previous lighthouse are now part of a hotel. The abandoned jetty speaks of a busier past. 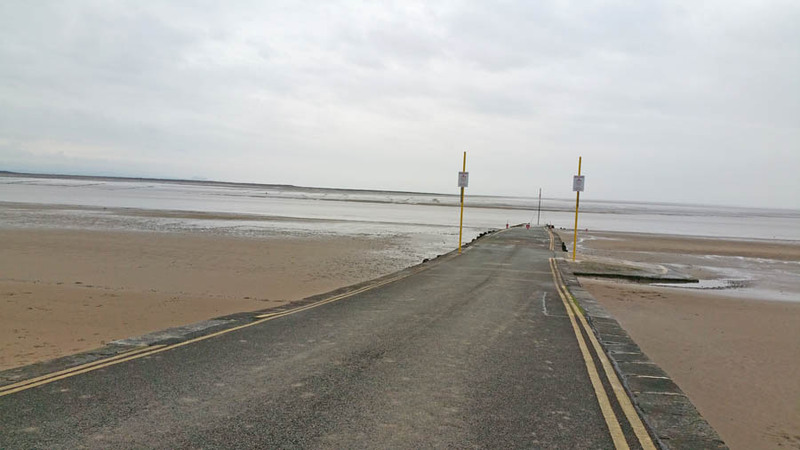 Steamships from Wales would arrive here, connecting with the railway service whose tracks used to run right out to the dock; now even the station has gone. The seawall is high and curved, there are storms in winter. The tide was out, exposing the mudflats. Rippled channels of water were almost invisible on the gleaming surface, swiftly filling up the flat expanse, bringing the sea back to the sandcastles. 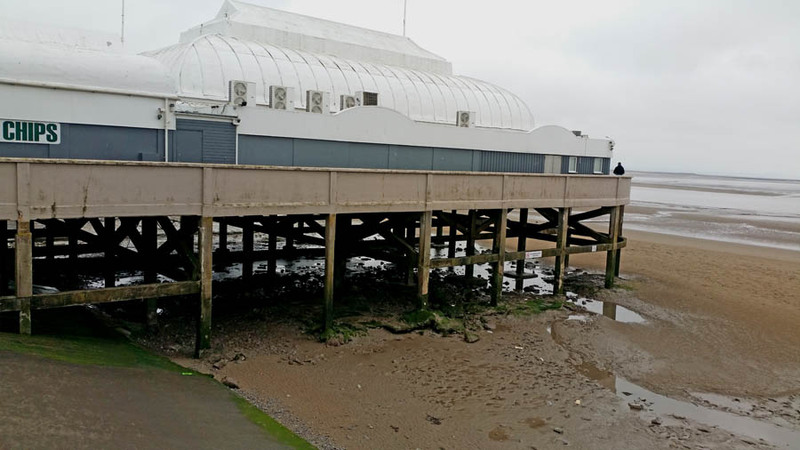 Gulls loitered in the seaweed crusted dampness under the pier; it was a quiet day at the beach. A short one too; the last bus leaves Burnham at one o’clock. Still, I had a good couple of hours at the seaside and a relaxing journey through beautiful countryside – just like being on holiday! This service got dumped by First Bus, since it wasn’t profitable, and has had to be patched back together by the town and parish councils along its route. It’s the only public transport for the outlying villages. Taking journeys like this is good training for using local buses in unfamiliar countries. Some key points need to be considered wherever you are. 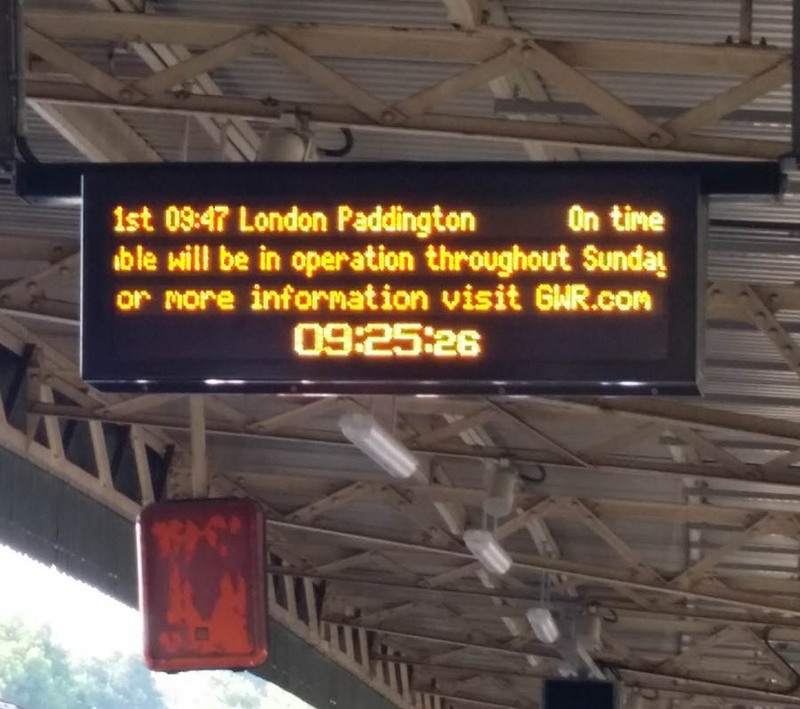 Timetables may be out of date. Check your return journey, or connections, with the driver before the bus abandons you in the middle of nowhere. Have some useful phrases printed or practised if you’re in a foreign country. Buses may be early. A rural bus with no passengers waiting is bound to be ahead of schedule at some points on its route. Arrive at the stop in good time. The bus may be full. A popular journey, such as the last bus back, may be crowded. Have a Plan B; an alternate way of getting back. Plot another bus route if possible, or check local taxi services before leaving. Testing your personal resilience with small, accessible challenges is a great way to build up your self confidence. Read the Resilience Handbook for more information, or just go straight to the free resilience assessment to see how good you are already! The challenges of growing vegetables continue; a very brief Spring has been swiftly followed by long hot days with no rain. The seedlings, root systems stunted by the unseasonable cold, struggle to gather water from the hard soil. 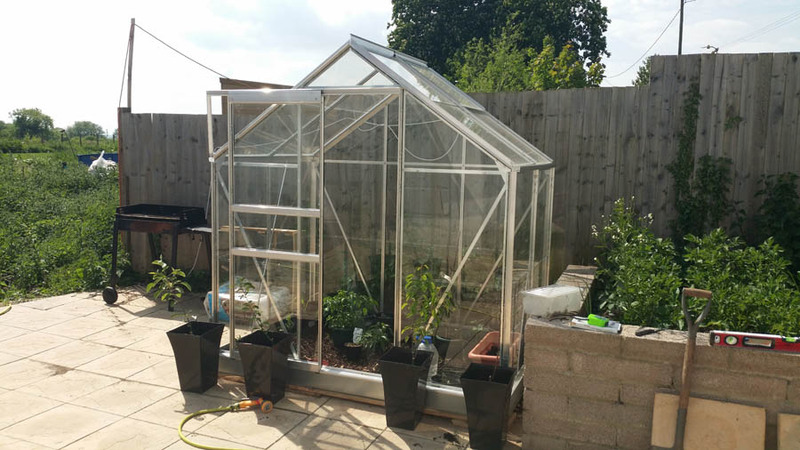 A greenhouse is becoming essential to cope with this erratic weather. If you plan to assemble your own, read the instructions carefully and proceed slowly. Photos of the demonstration model in the garden centre could prove useful. Watering the allotment, some miles from where I live, is a daily chore. Mature plants are doing far better than fresh sowings, but I’m still concerned about the meagre amount of food coming up. 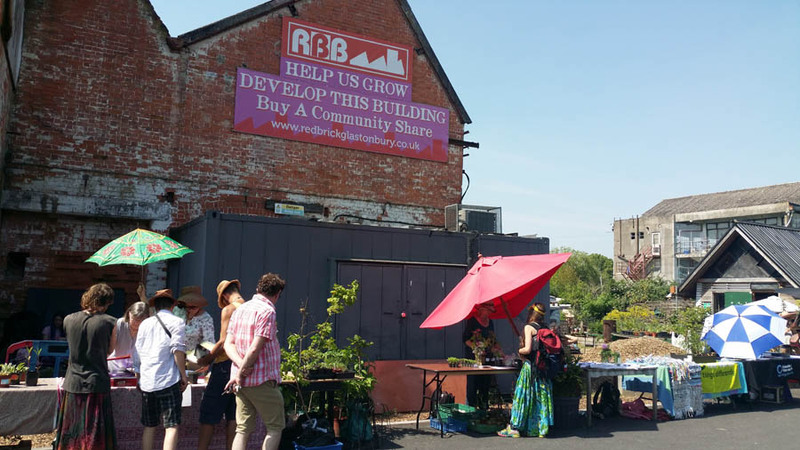 The Resilience Garden benefits from waste household water and a handy tap. The role of water in cultivation is highlighted by this drought. The kitchen gardens of old came as much from the availability of used water as from the convenience of having herbs to hand. 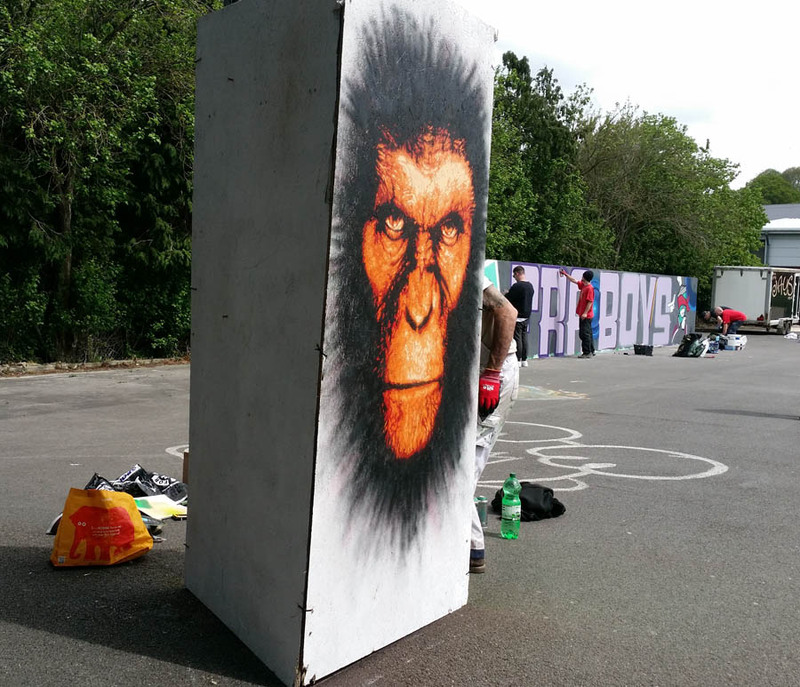 …and there was a Graffiti Day at the skateboard park. 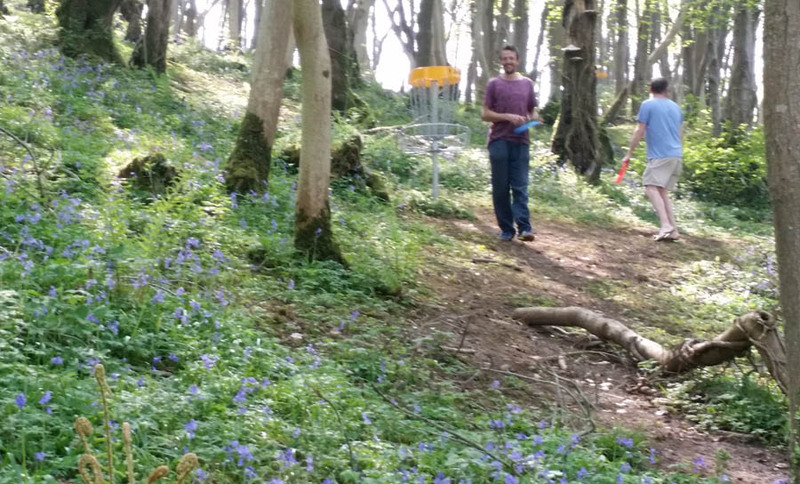 We went to try out the archery at Mendip Snowsports Centre, and discovered Frisbee Golf! Although not all the baskets were this deep in woodland, my frisbee always headed for the nearest nettle patch! The centre offers bushcraft and target shooting, as well as the artificial slopes for snow-related activities. There’s a pleasant cafe and bar; a good place to have a day brushing up your resilience skills. Networking is an important part of community resilience, a whole section of the Resilience Plan. People need to exchange news after the winter season, when travel can be limited. It’s important to be aware of dangers and opportunities in the local area and beyond. The concept of ‘Six Degrees of Separation’ was identified before the internet was developed; we need not be dependent on technology for our world news. Local events, with their travelling pedlars and performers, were once key information nodes, and often more fun! 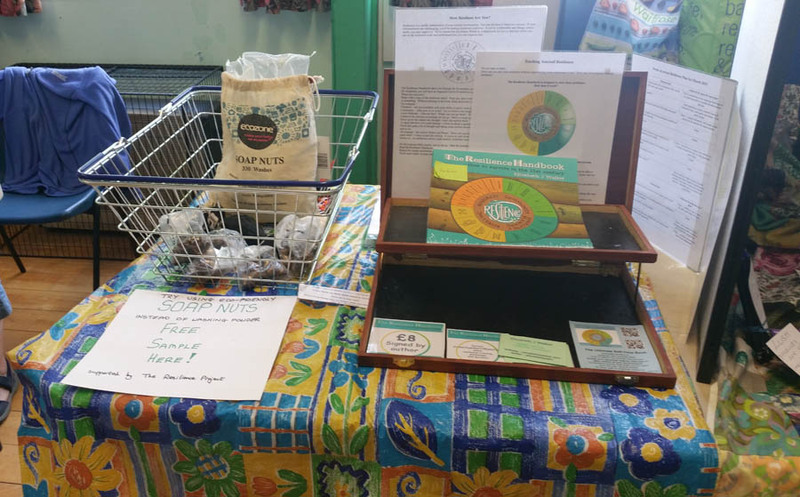 The free soap nuts were a great success at the Repair Cafe! When Spring finally arrived in Somerset, it came with all the gardening jobs it was just too cold to tackle earlier. May is proving another busy month! The festival of Beltane, marking the start of summer, should be the time when you can relax, stop treading on the soil, and watch your crops grow. This year, I had three batches of peas fail to come up – though one is starting to show now – which was a disaster, since this is a heritage variety called Telegraph which I’m seed-saving from. 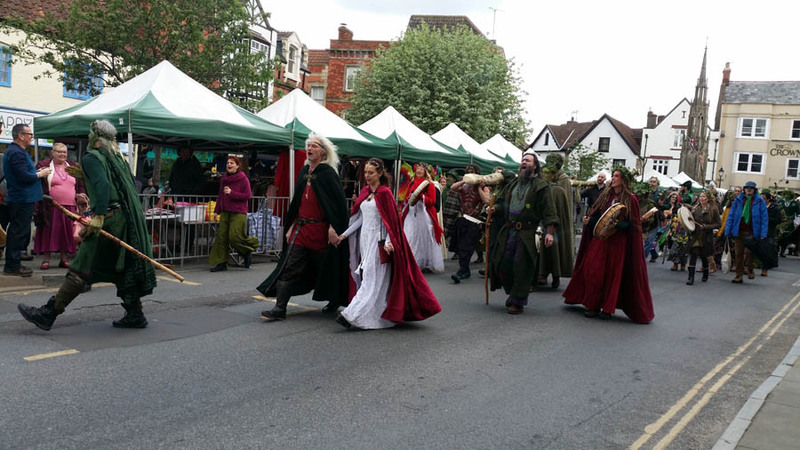 The very last seeds were being soaked before planting – something I don’t normally bother with – when I took a day off to attend the May Day festivities in Glastonbury. 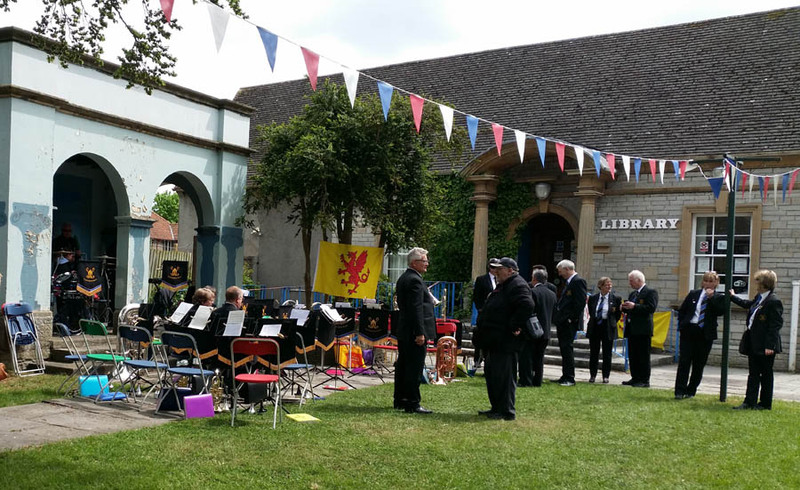 The Tuesday market was occupying the Market Cross, so the Morris dancing took place on the newly acquired patio of the Town Hall. 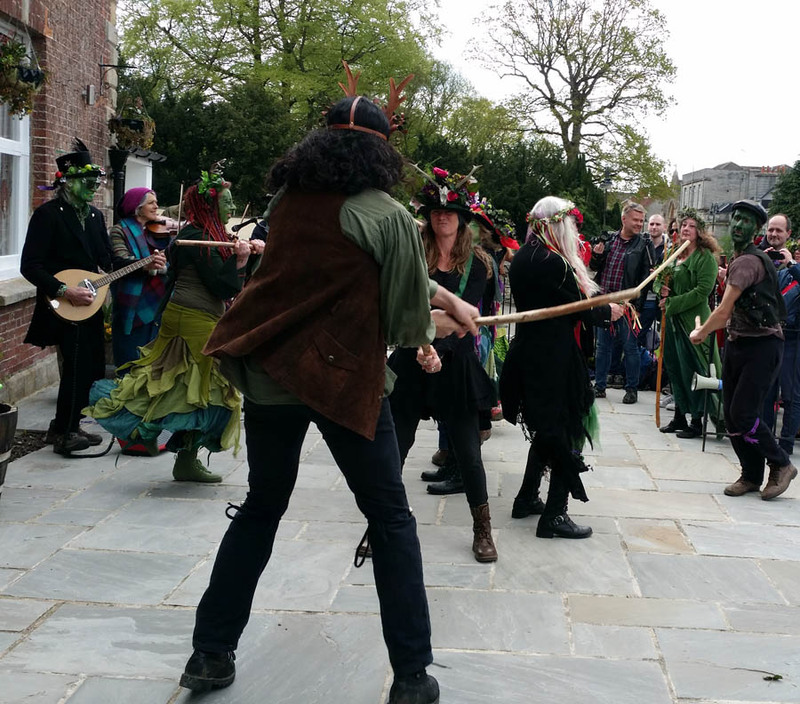 Speeches and bardic recitations followed until the Maypole itself was carried down the High Street by the Green Men. More speeches and announcements followed. I was at the edge of a growing crowd and it felt like the sketch from the ‘Life of Brian’ (‘What did he say?’ ‘Blessed are the cheesemakers, I think’). The procession wended back up the High Street, past the White Spring to Bushy Combe, as described in this post from 2015. 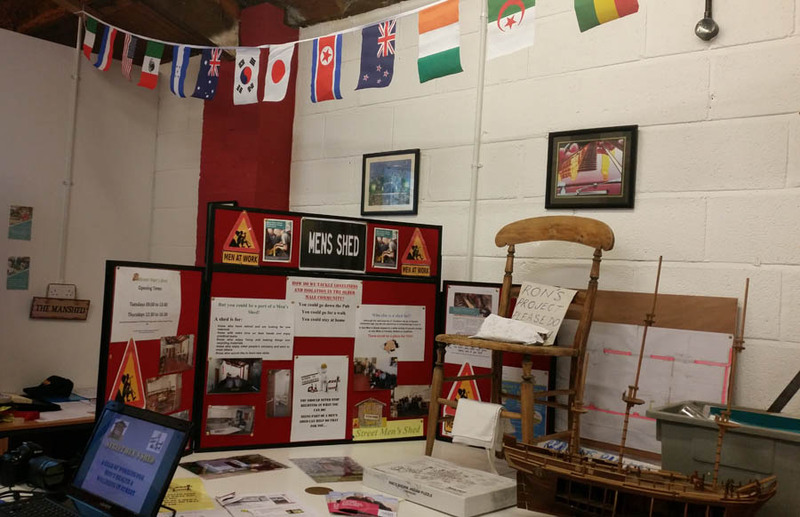 The White Spring is run by a committee of volunteers now, who endeavour to keep it open as much as possible. It’s well worth seeing if you’re in the area! 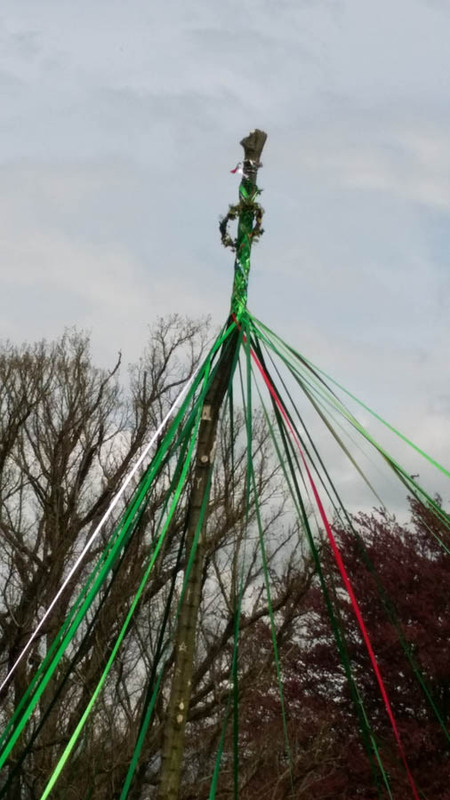 The Maypole was duly erected following more ceremonies and recitations. I would have preferred blessings on my peas to vague invocations of universal love, but few people appreciate vegetables these days. It’s a colourful spectacle though; both celebrants and audience take some trouble to dress up for the occasion. The practical aspects, such as untangling the ribbons as the pole goes up, offer plenty of breaks for chatting. Quite often in previous years, the ribbons ended up tangled in a big clump off to one side of the pole! Now, enough people have got the hang of the right way to weave in and out that they can keep others on the right track – anyone at the ceremony can take a ribbon and join the dance. This nice tight winding lasted all the way down. During most of the dance, four strong Green Men braced the pole, as it takes a surprising amount of strain from the flimsy ribbons! The completed pole is moved when all is done, and stored until next year when a new pole and ribbons are sourced, since the field is needed for other things. The Community section of the Resilience Handbook provides advice on organising your own community events. These are a good way to meet neighbours. Even casual acquaintance helps, should you ever need to cope with an emergency together. Make a point of attending local events, if only in a ‘walk-on’ role! The weather in the Summerlands went straight from cold and icy to cold and wet. I planted some onions, but the peas went in the neighbour’s greenhouse to get started, and the potatoes are still chitting in the shed. I found out that you should wait until the soil is roughly the same temperature as the potatoes before planting them. I’m experimenting with new varieties this year, so there should be notes. 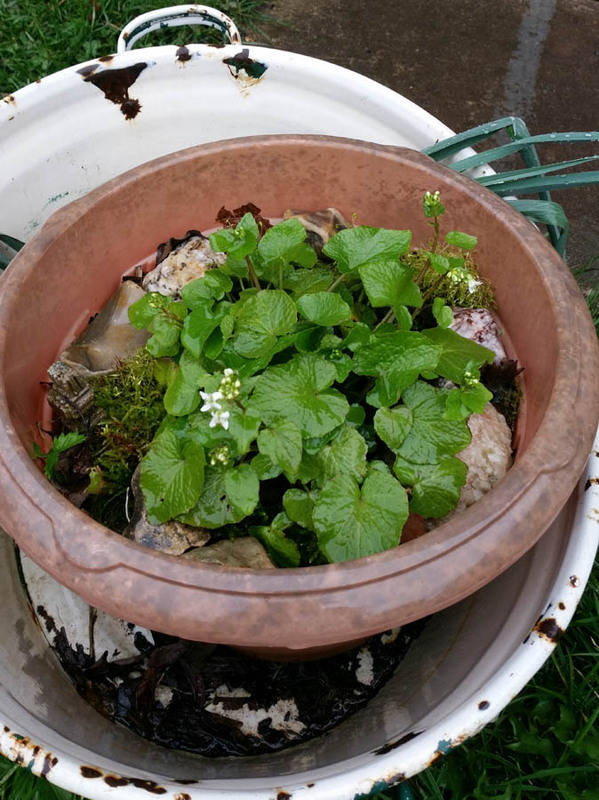 The wasabi plants thought they might die, so they flowered again; they haven’t done this since the last snow, seven years ago! There are four pots, all cloned from the same rootstock, and they all flowered at once, even the one kept some miles away at the allotment. Starting with a scrawny two-year plant from the market, over the years their leaves have become smaller, glossier and tougher. Wasabi are awkward customers in that they like damp but cope badly with slugs; they make up for this by thriving in the cold weather. 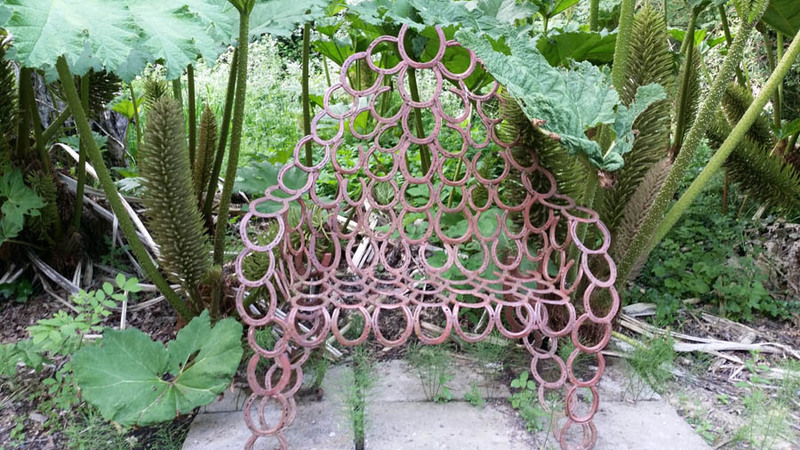 I planted out the burdock salvaged from the resilience field. Three plants had shared a pot over the winter, and their calorie-rich roots grew so fast that there was hardly any soil left. I’m hoping to start a breeding colony in the woodland strip. 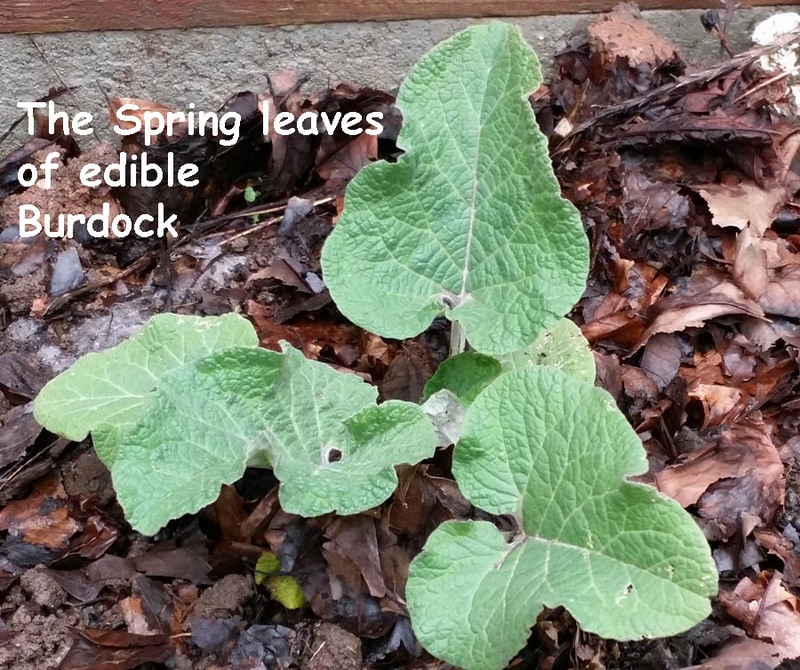 I’ve written about burdock in ‘Recipes for Resilience’ as it’s a good emergency food source. 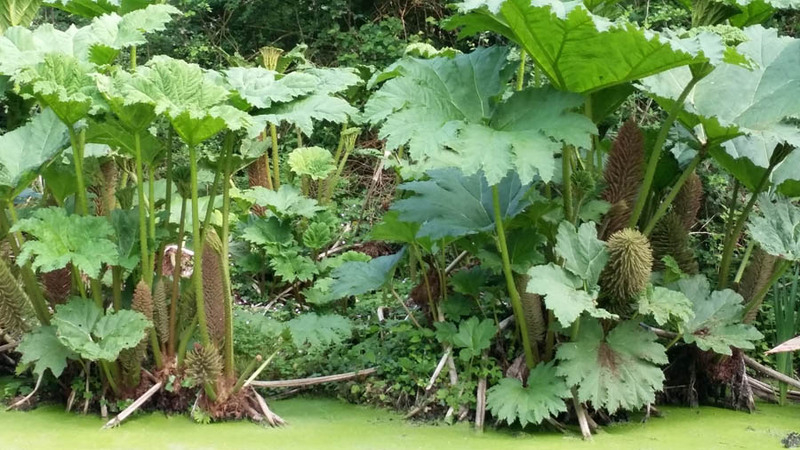 The root fattens up in the first year, and is used up in the second summer to produce the large flowering stems. This is a good time of year to harvest these roots, but only the spring leaves can be seen. 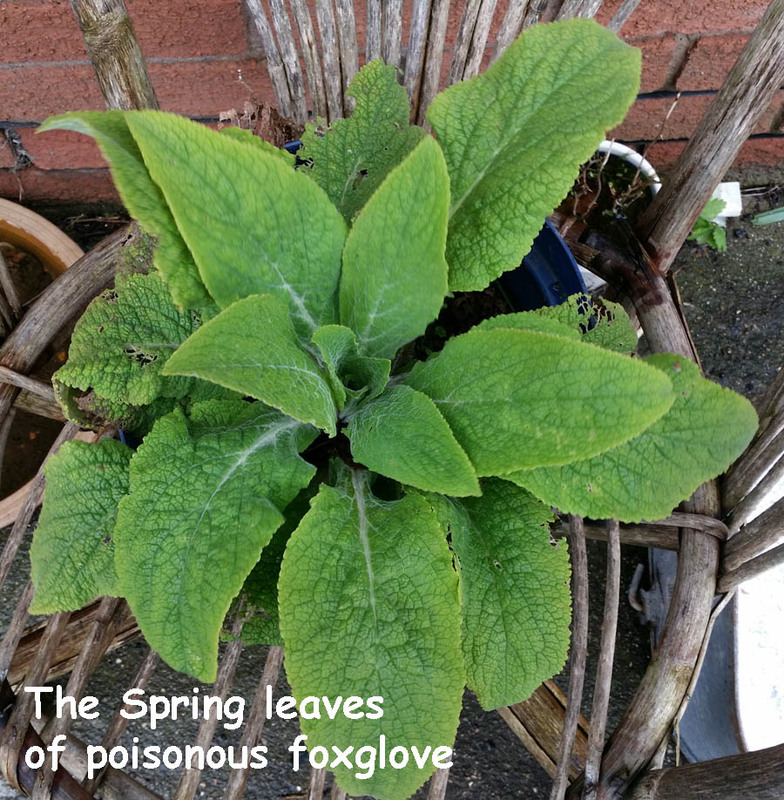 Growing both these plants in your Resilience Garden enables you to study them in detail, so you won’t dig up the wrong one – note the foxglove is kept in a pot. Feel the leaf textures and observe the shades of green. Practise identifying them on a forest walk – but don’t dig up wild plants as that’s illegal in the UK unless you have the landowner’s permission and it’s not an endangered species. Take pictures, and return later in the year to see if you were right. It takes a couple of years’ study to really learn a plant. The dismal, threatening weather meant the planned Magic Oxygen Literary Prize Giving was filmed for YouTube. None of us were confident about travelling to Lyme Regis, given the weather forecast! Although we didn’t get much snow here in the South, the rain was relentless and there was a lot of water on the roads. Saturday itself was almost a nice day. I worked on some of the infrastructure projects in the garden, feeling that these should have been finished weeks ago. The plum tree is blossoming with the utmost caution; the bumblebees are about, but I haven’t seen any honey bees yet. Winter slinks out of the door, turning to snarl “I’ll be back!”, as Spring tiptoes tentatively in. It’s starting to look like a late Spring here in a thawed, but still shocked, Somerset. Plants are cautiously emerging, but the buds on the trees remain resolutely closed. As their roots are still dormant, you’ve a little time left to plant out saplings. This should be done before late March. Apples are such a staple food that it’s good to have a tree in your garden. Our estate was built on an old orchard, and a few of the original trees are left. My neighbour has one, left to grow to its full size over several decades. You don’t necessarily want one that large. Techniques for growing smaller trees have been developed over the centuries since the sweet Chinese apple came over the Silk Road to Europe. Our native crabapple was bitter, but adapted to the climate. The sciences of grafting, pruning and cross breeding were known to ancient cultures. Today, a vigorous rootstock is grown, then the top part of this tree replaced with a branch from a ‘fruitstock’. The resultant apple tree takes on the shape of the root variety, yet provides fruit from the graft type. You can buy dwarf trees, bearing your favourite apple but staying quite small. These aren’t cheap, and will be something of a fixture; it can be several years before you get any fruit at all. 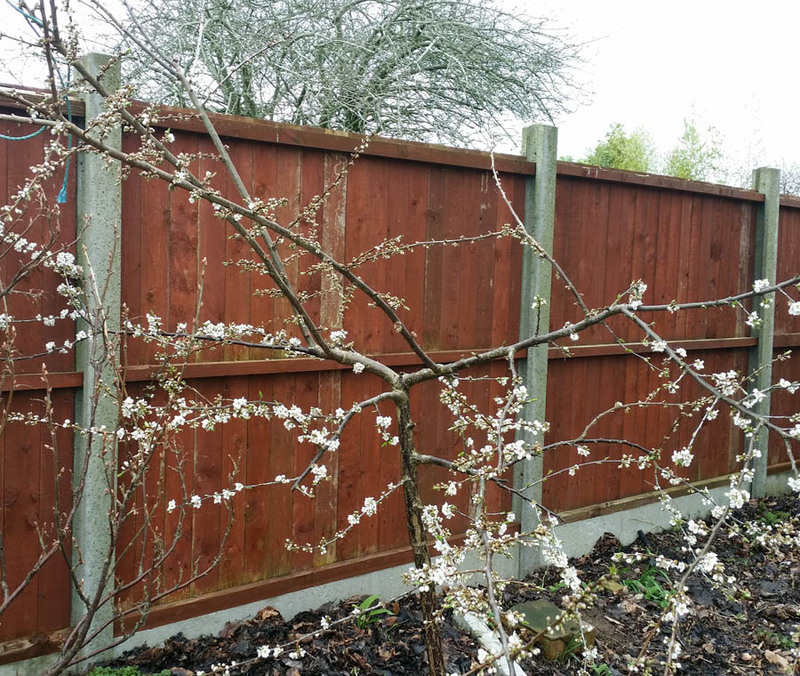 It’s worth going to a short course with an expert to learn the basics of orchard management and how to apply these to your garden. Knowledge of this kind is a community asset, as described in the Handbook, so I went on a refresher course. Anthony Ward, our tutor, is the keeper of the Chalice Well orchard in Glastonbury. 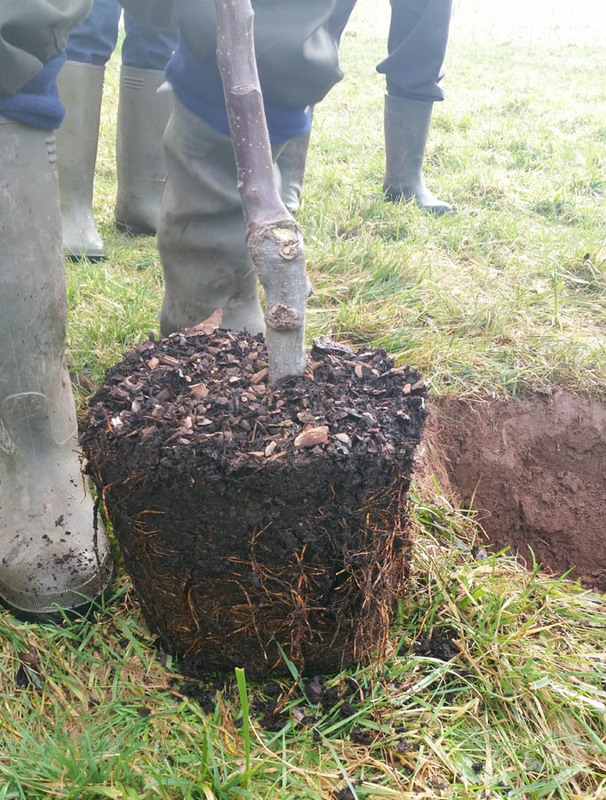 We were planting some trees in a new field at Brook End Farm, situated where the Levels rise into hillier ground to the east. You can see the knobbly bit on the trunk from the graft. If you have a pot-bound tree like this, dig your hole square so the roots can spread out easier. The stake is driven in after the tree is planted. Modern ties allow more movement, as the action of the wind strengthens the roots. The grass is kept away from the trunk with a mulch; a precaution ignored with less valuable trees. For the first few weeks, make sure the sapling neither dries out nor sits in a puddle. Then forget about it till it needs pruning, which is a whole other story. 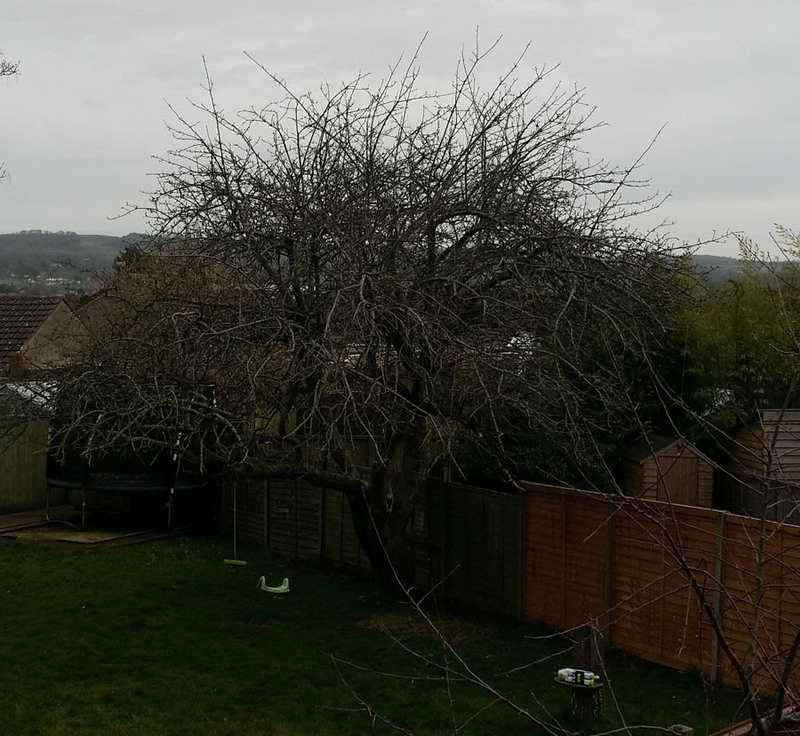 This is the apple tree in the Resilience Garden. It grew from an apple core hidden in a plant pot by my daughter. Although it produces good red eating apples, it clearly wants to be a very large tree. 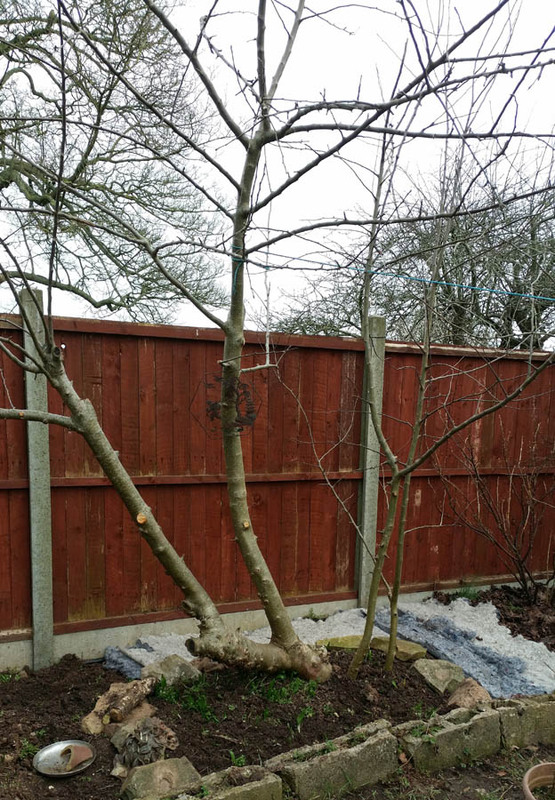 It’s an example of very bad pruning; I tried to make a ‘goblet’ shape without taking into account the shading from the fence behind. After that, I appreciated the courses more. The mulch to the right of the tree is the filling from a defunct futon mattress, which I’m covering with a thick layer of leaf mould. I have access to a large pile of this; otherwise I’d use soil exported from the raised beds. The green shoots are wild garlic; they’ll be ready to harvest soon. Blend everything together and serve with pasta! I couldn’t resist adding that recipe, from ‘Recipes for Resilience‘…..wild garlic does make a lovely pesto and it has quite a short season. I grow a lot of it under bushes and in the wild areas, as very reliable spring greens. The nettles are coming up too – vitamins arriving at just the right time! 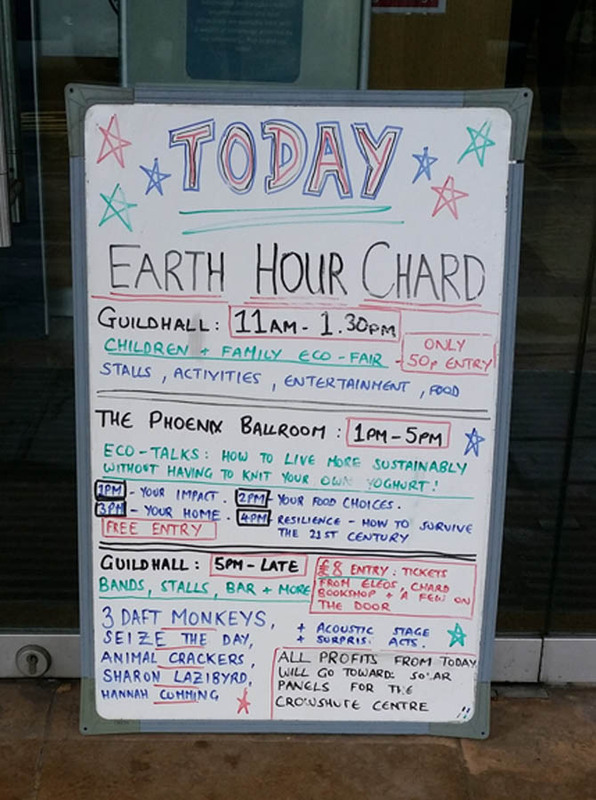 I’ve been asked to talk about resilience at the Earth Hour event in Chard, Somerset on the 24th March; I’ll be signing Resilience Handbooks too. 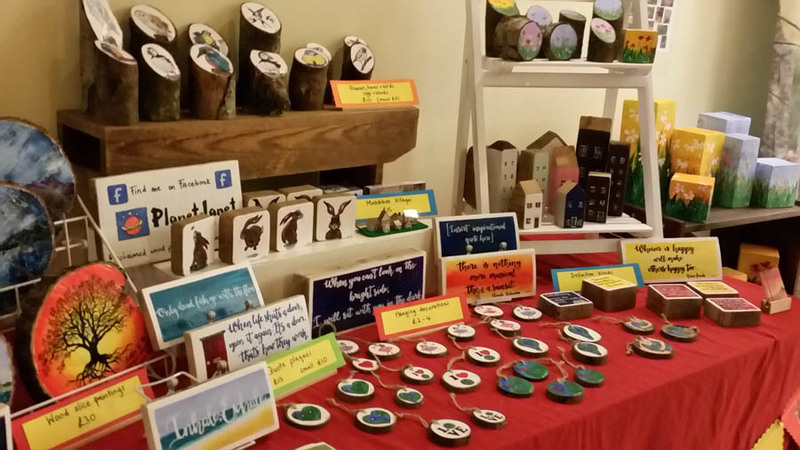 The daytime events are free, so drop in if you’re in the area! Although Somerset escaped the blizzards from the East at the start of last week, we were nailed by the storm front coming up from the South for the weekend. Thursday morning, a light but relentless snow began to drift around the lanes. By early afternoon, there was a state of emergency declared in the county and most roads were impassable as the winds rose and the snow piled high. The starlings huddled in their bare tree like frozen clumps of leaf, then were obscured from view entirely as dark came early. I can’t imagine how they made it back to their reedy homes in the marshlands. 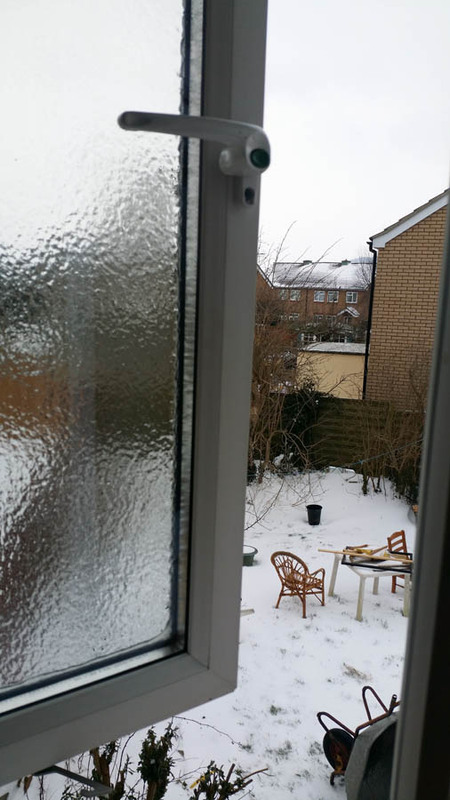 Late in the night, a freezing rain fell, which covered the fluffy snowdrifts with a layer of sharp-edged ice. This weather was out to get you. 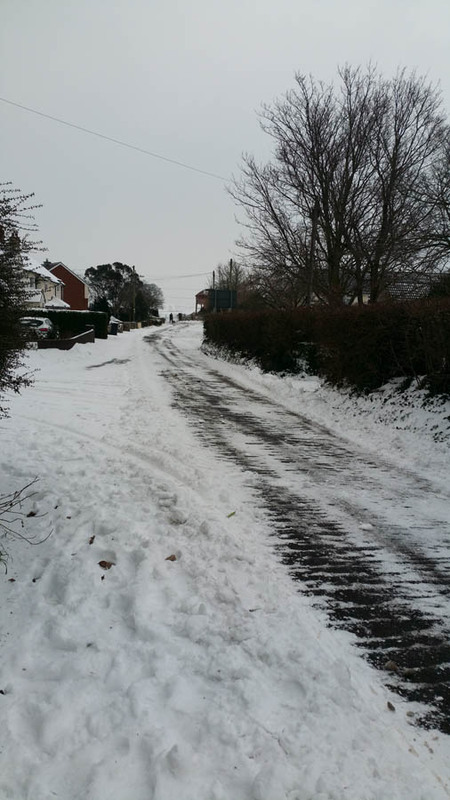 Our parish was quite lightly affected – we have no main roads or other major transport links to look after. The few vehicles that braved our lane were in the service of utility maintenance. Apart from some low gas pressure, our supplies remained intact. Many other areas lost power or water. The tractor cleared our lane quite early on Friday, but the main road was barely functional. 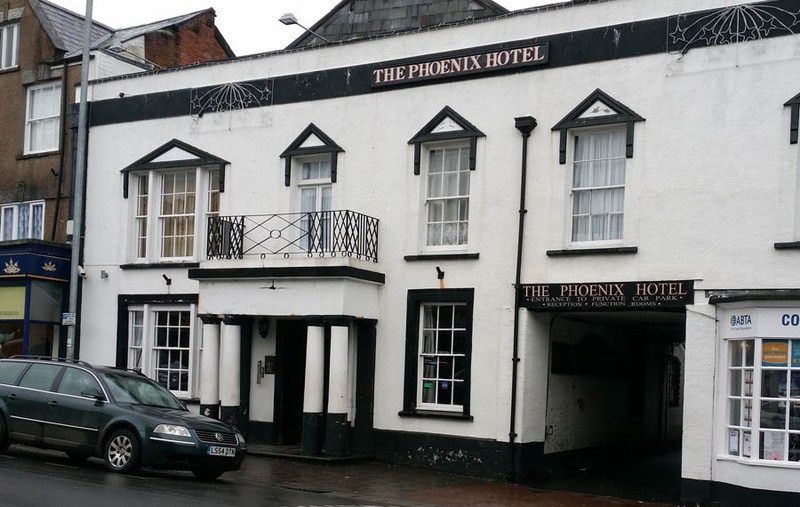 My intrepid young lodgers walked the four miles into Glastonbury town, where the situation was about the same. The tyre tracks were in danger of freezing into black ice at any point; temperatures took a sharp dive after sunset. 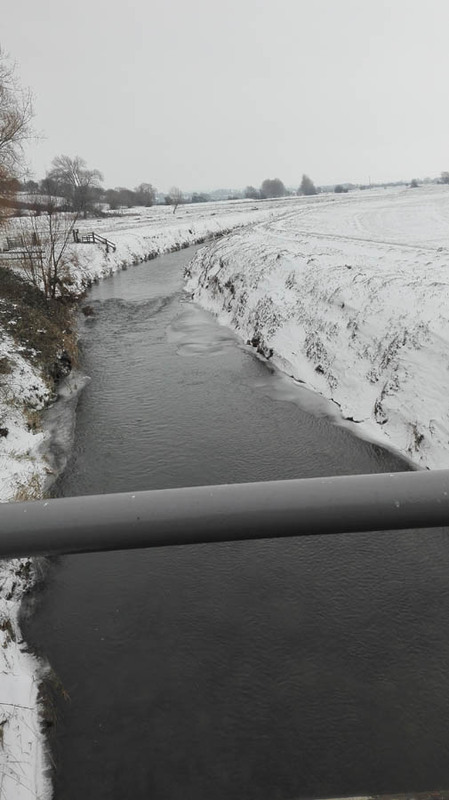 The River Brue was frozen. School was most definitely out! Everything seemed to just freeze in place for the day on Friday; there was a major incident declared for the county. 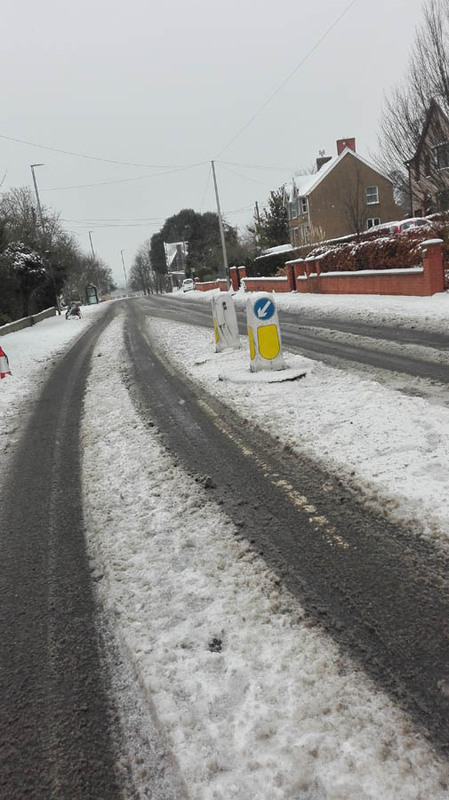 People dealt well with not going out, allowing service providers and those who’d been caught away from home priority in using the roads. There wasn’t any point in making strenuous efforts to clear the snow away. There’s nearly twelve hours of sunlight a day at this time of year. Once the maverick weather had blown over, natural solar power would do the trick, and so it proved on Saturday. The kids had hardly time to borrow a sledge before the snow was all gone! It’s been seven years since our corner of the Shire had anything more than a light dusting of snow. On Sunday, I was reminded of one of the reasons I wrote the Resilience Handbook. 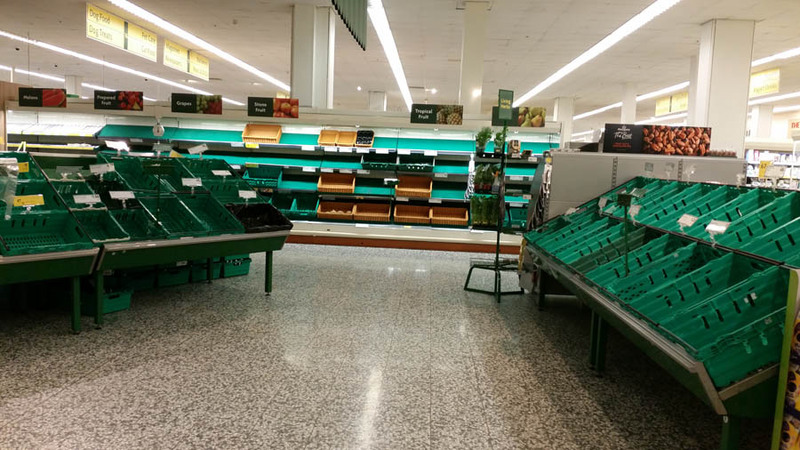 This is a typical supermarket in Mid-Somerset, two days after the emergency was over. 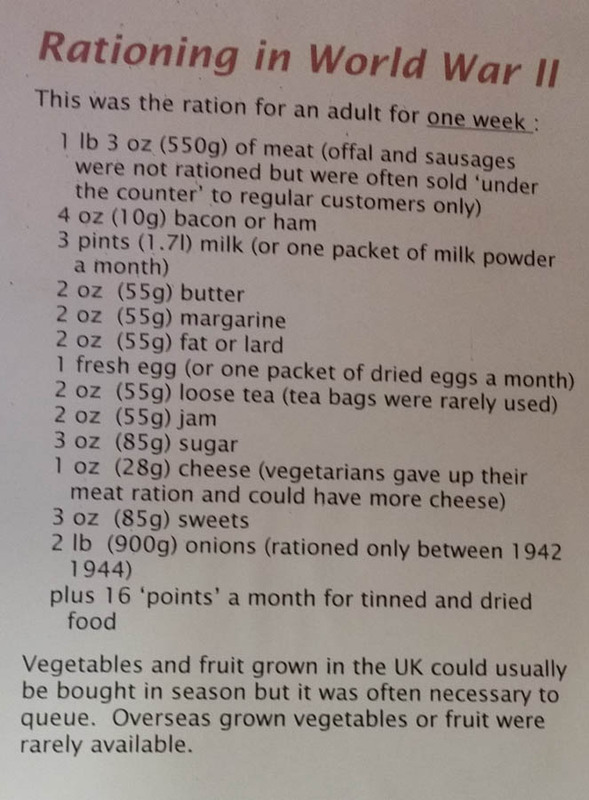 There’s no fresh food at all (except a tray of celeriac, which no-one knows how to cook). Will this remind Glastonbury Town Council that allotments have their uses after all? 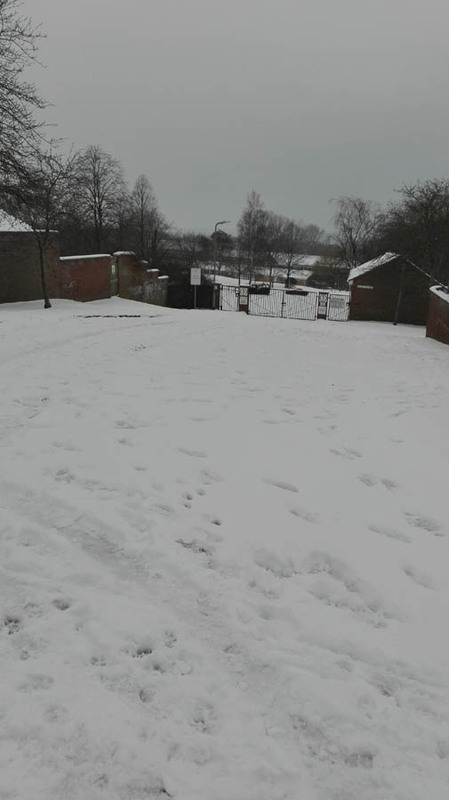 This snowfall occurred in March, on the edge of Spring. It could have been a whole different story if it was in December. Back to normal next week with a bit of luck….the seed swap and the freecycle day were both cancelled, and I’ve missed the potato days now. Luckily I can pay a visit to the organisers, at the Walled Garden in nearby East Pennard to see what exotic varieties they have left!